Congrats on starting the next big chapter in your life: college. The first step? Orientation. But don’t let that word scare you -- it’s not as bad as you may think. 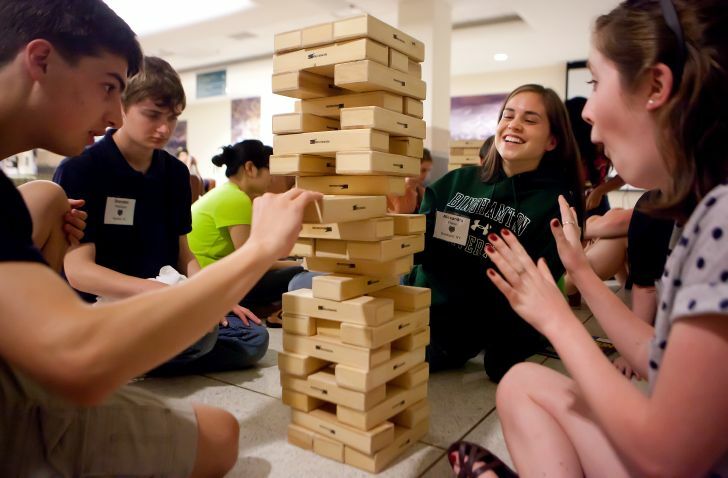 Here are some tips to make the most of orientation and get through it as smoothly as possible. 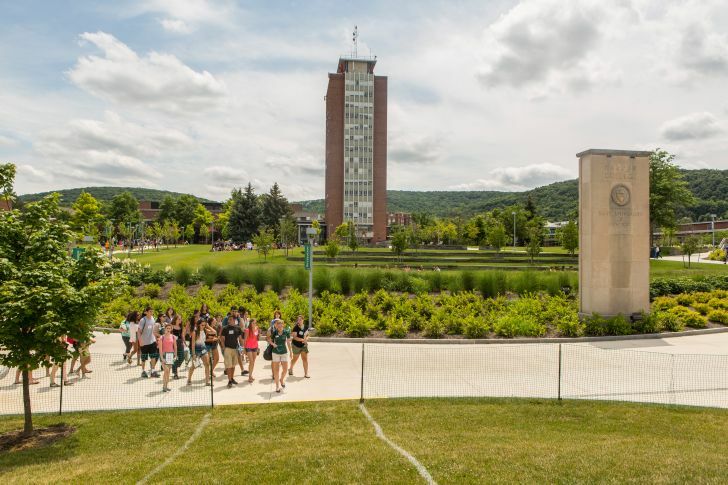 Make sure to check out my.binghamton.edu and complete the orientation checklist. 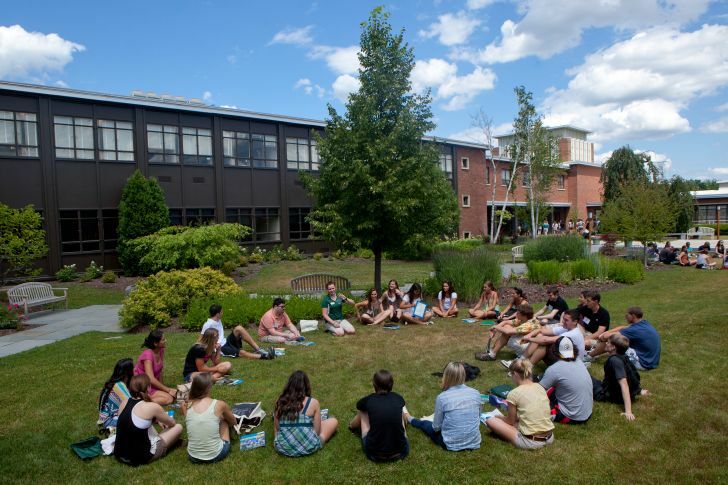 This list contains important things you need to do before arriving for your session, as well as items you should bring along to ensure that you have the most productive orientation experience possible. Before you can participate in orientation, you have to actually get there. Look up directions to campus so you know where you’re going. 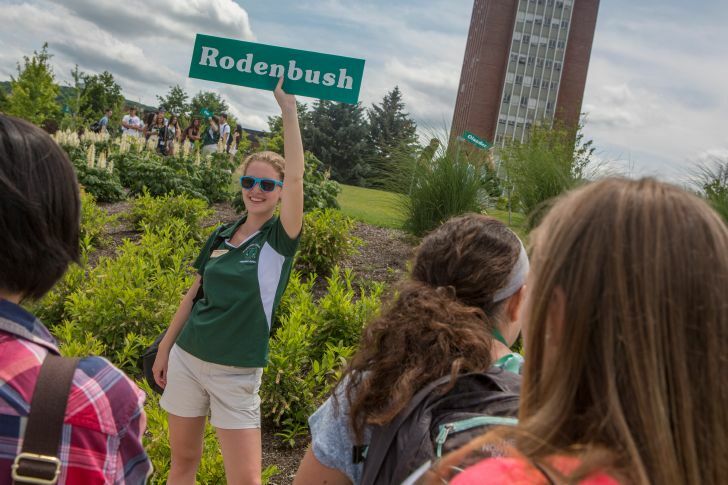 Freshman Orientation is a busy, two-day affair, so familiarizing yourself with the schedule is definitely a good idea. It will help you know exactly what’s coming up, so you're not confused about where you should be, or what you should be doing. 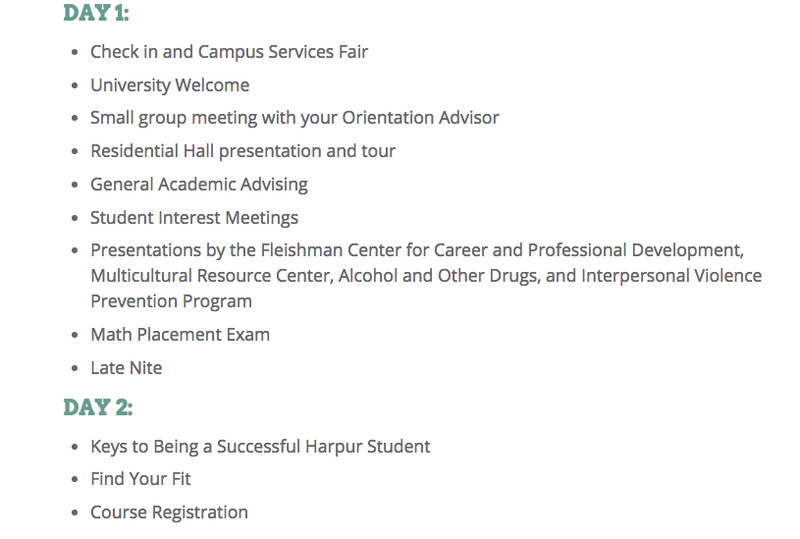 You’ll get a more detailed schedule at check-in the day of your session, but here’s a brief overview. Most importantly, you can check things off your list as you do them, and who doesn’t love doing that? I know telling you not to be nervous is easier said than done. However, this is a new experience for everyone else too, and they’re just as nervous as you are, so try not to stress too much! I came in as a transfer student my sophomore year, so on the day of my orientation I was especially nervous. It was like starting all over again -- take two -- and I was afraid that it wouldn’t go well. But everyone was so friendly and helpful that it ended up being a great experience, and I realized I had nothing to be nervous about. 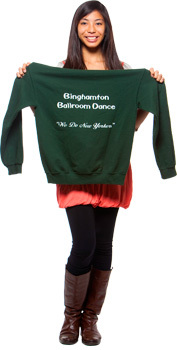 In fact, I left orientation even more excited to start my new journey at Binghamton. I know it’s super awkward because you don’t know anyone and you’re in this completely new environment, but take orientation as an opportunity to start getting to know people. Sure, they may not become your new BFF’s, but having people to stick out orientation with makes it more fun and less stressful. 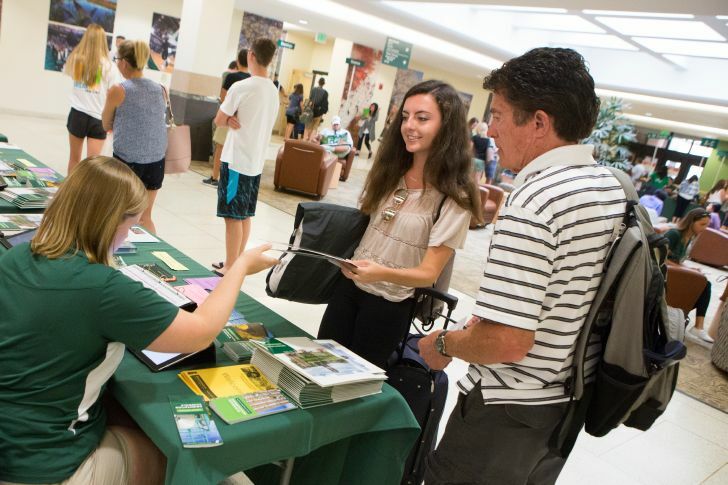 Asking people where they’re from or what they plan on studying are two great ways to strike up conversations with fellow Bearcats. If you have questions, don’t be afraid to speak up! No question is too dumb and no amount of questions is too many. So go ahead, ask away! If you’re too shy to raise your hand during one of the larger group sessions (like me), wait until you break up into small groups, or ask your orientation advisor one-on-one. You’ll be thankful you did. I remember thinking that my orientation was long and tiring, and for transfer students it’s only one day. So much information is thrown at you, but it’s all really important. Try to stay attentive, and listen to what everyone says over the course of both days. 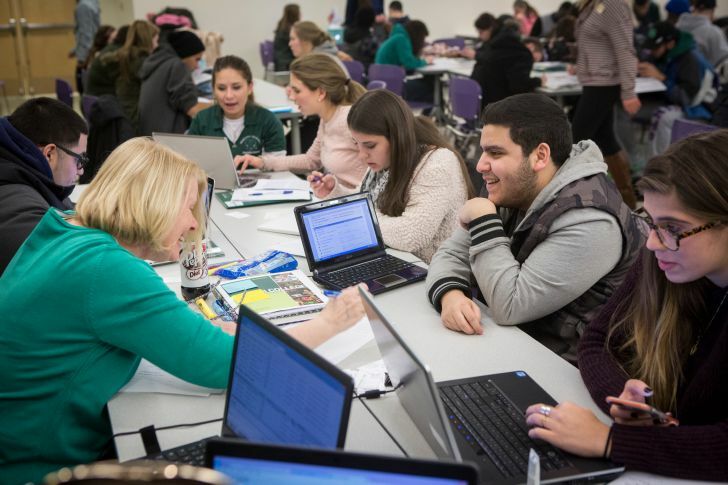 Pay special attention during your academic advising meeting because they’re going to help you figure out what classes you should register for. My advisor literally planned out my schedule for me and gave me back-up options in case I couldn’t get into a particular class. Yes, there are icebreakers. No, you cannot avoid them. Embrace the inevitable awkwardness of them and just go with it. For my icebreaker, we were outside and playing a game that involved a lot of moving around, so a bunch of us kept colliding and doing that awkward dance where you both move in the same direction and then collide again. Bottom line: Don’t worry about how you look or what you say. After all, they’re meant to be fun and silly. Don’t forget to bring anything you may need to spend the night on campus. It may be helpful to make a checklist so you don’t forget any important items. You also may want to consider bringing a fan for your room in case it’s 100 degrees the day of your session. I brought a fan to my freshman orientation (which was a THREE-day affair at the school I went to) and it was truly a lifesaver. At Transfer Orientation, I didn’t get to go to “Late Nite” after day one because orientation for transfer students is only a single day. But as an undergrad, I went quite a few times while living on campus; you definitely don’t want to miss this early first chance at experiencing the fun of Late Nite at Binghamton. There are games, movies, snacks, crafts and even bowling! So don’t turn down your sheets and hop right into bed after the first day; head on over to Late Nite and see what the fun’s all about. College is the perfect opportunity to reinvent yourself. Want to try out a new hairstyle? Do it. Want to join a club or try a new activity? Go for it. Want to revamp your wardrobe? As long as you don’t run your wallet dry, have at it. Everyone does their own thing in college -- it’s part of finding yourself and becoming the person you want to be. Don’t be afraid to try new things; it’s all part of the process.